Alexandrina Hemsley and Jamila Johnson-Small are London-based dance duo Project O. This May they bring the UK Premiere of Voodoo – an 8 hour durational work in 2 hour sequences – to the Lilian Baylis Studio. We talked to them about Voodoo and the process behind creating this unique and powerful show. Can you tell us a bit about the inspiration behind ‘Voodoo’? Voodoo was what happened when we got back into the studio to work on a performance for our own bodies rather than choreographing SWAGGA, a dance for Charlotte Cooper and Kay Hyatt. We were asking what would happen if we stopped trying to fight misrepresentation and the projections of the gazes of others and instead, assumed them, and started thinking about ourselves as all of it, everyone. ‘Black’ is a historical term that unites an unimaginably vast and diverse groups of people under one singular identity – what if we can summon all those people into the room? Traversing geography, time and even death. We were thinking about history and trying to respond to the reality of underwritten and/or purposefully suppressed histories and of dancing as a live re-writing of experiences that unfold over time. What is the relevance of the title ‘Voodoo’? It’s evocative, no? It is also purposefully appropriated – a kind of active mirroring back to the sense that racist structures both take from other cultures and assume that nuanced cultures can be condensed into one symbol, object or thought. In using the word to conjure senses of ritual, and shifting through physical states of ‘communion’, but not directly drawing on or researching voodoo cultures, we comment too on the impossibility of knowing a history or practice our ancestors were purposefully and violently displaced from. What can the audience expect from the performance? For their own bodies to be implicated, moved and moving. Voodoo is an immersive ritual where the roles of everyone involved shift throughout the show. Audiences can expect to enter another world, shaped by an amazing original soundtrack composed by Verity Susman. Had you always intended for ‘Voodoo’ to be a durational, 8 hour performance, or did the idea arise through the creation process? We started with wanting to make a long work, we wanted to dance for a long time, to know what that would feel like. The first iteration of the show was late 2015 at Chelsea Theatre and Cambridge Junction and this was a 4 hour performance – it didn’t feel long enough! So we thought 8 hours might feel long. So far we have only performed for 4 hours, the 4-8 hour stretch is excitingly unknown! What do you think the 8-hour ‘durational’ nature of the performance adds to the experience for the audience? The 8 hour duration is there for us, our bodies, our dancing, our experience – it’s important not to forget that performance is not only about the performers giving, serving an audience but an exchange. It’s also a process of exploration for us. We do want the audience to know, to feel, that the work has a history, that they are not the first, that the show is a ritual that they contribute to but that isn’t necessarily ‘about’ them. Themes of the work include ideas about time, memory, history, place, dimension, state and bodies shifting, clashing, transforming, morphing, merging, blending. How do you imagine each ‘2 hour show’ will differ from the next? The structural changes between each 2-hour segment are very slight but this is an immersive work, dealing in improvisation and our bodies and decisions within each sequence will be responsive to the shifts in energy that the different timings and audiences will bring. We are anticipating that at the 6pm show, us and the audience will feel very different to the 12am show! And the history that gets built up during this time in the LBS, over the course of the evening, will transform the space so that each performance will begin from a different place. What is the process between now and the performance dates? More days in the life of being a freelance artist – preparing ourselves for this undertaking through various dance rehearsals, listening to the sound and working with the assistants who are also part of the work – Fernanda Munoz-Newsome, Malik Nashad Sharpe and Katarzyna Perlak – each one is a practicing artist whose concerns overlapped ours in various ways and whom we asked to help form and sustain the world of Voodoo. We self-produce but with Voodoo we have had input from project manager Toni Lewis, so we’ll be working with her on the logistics and other practicalities. What will be the next steps for ‘Voodoo’, do you plan to develop the piece, or the durational nature, further? Following the premiere at Sadler’s Wells we would like to tour the show. Click here to discover more about Voodoo. Watch Artistic Programmer Eva Martinez talk more about Project O in this Sadler’s Soundbite. 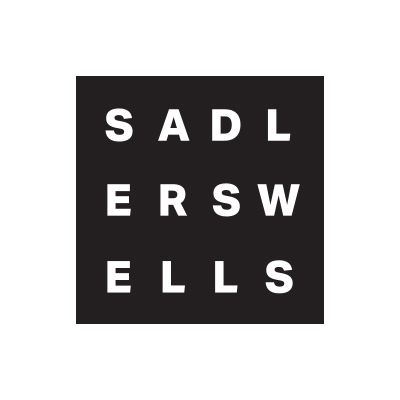 Tickets are on sale to members from Wednesday 17 May at 10am for Sadler’s Wells’ Autumn / Winter 2017 season, which features a host of new shows by the theatre’s Associate Artists and companies produced or co-produced by Sadler’s Wells, including a highly personal new production by Wayne McGregor that, in a world first for dance and the arts, has genetic sequencing at the heart of its choreographic research. Public booking opens Monday 22 May at 10am. 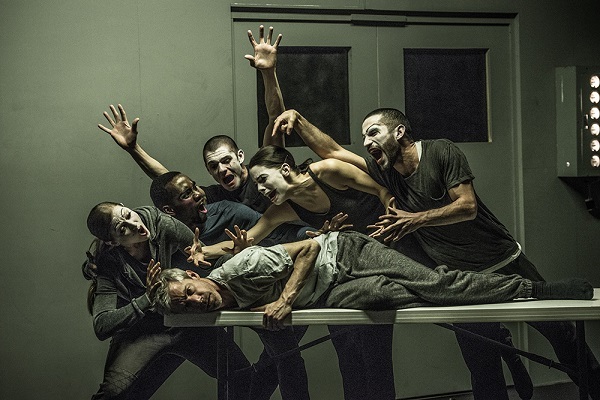 These productions include a total of five world premieres by Wayne McGregor and BalletBoyz, a UK premiere by Hofesh Shechter and the much-anticipated UK premiere of International Associate Company Acosta Danza. Audiences will also have another chance to see work by Jasmin Vardimon, along with award-winning productions by Matthew Bourne (performed by Resident Company New Adventures), Michael Keegan-Dolan, and Akram Khan (performed by Associate Company English National Ballet). Khan also curates the dance programme of the Darbar Festival, which Sadler’s Wells hosts this year for the first time. Alongside works by established artists, the Autumn / Winter 2017 season introduces three distinguished dance-makers to Sadler’s Wells for the first time; Shobana Jeyasingh, Meg Stuart and Kyle Abraham. Other seasonal highlights include Birmingham based Rosie Kay’s award-winning choreographic representation of her time spent with the 4th Battalion The Rifles, 5 SOLDIERS: The Body is the Frontline. As part of the London-wide annual Dance Umbrella festival, three acclaimed choreographers; Lucinda Childs, Anne Teresa and Maguy Marin, each create inimitable dance works to the same piece of music, Beethoven’s Grande Fugue op. 133. And this Christmas marks 20 consecutive years of The Snowman enchanting young audiences at The Peacock, with a magical mix of exquisite dancing and live music – including Howard Blake’s much-loved Walking in the Air. For more details on the exciting season ahead click here. To become a member and access tickets before the public, click here for more information. Sadler’s Wells’ jam-packed, annual festival of family-friendly events, returns this Easter! Family Weekend takes over the building, offering something for all ages with fun activities, arts & crafts and workshops which complement the main house show, which this year is the award-winning company Aracaladanza’s Vuelos. Taking inspiration from Leonardo da Vinci’s quest to make man fly, choreographer Enrique Cabrera uses Aracaladanza’s trademark style and charm to make dancers canter like horses, make a mess at the dinner table, play with fluttering birds and grow wings of their own. Over in the Lilian Baylis Studio, join storyteller Vanessa Woolf on an adventure through a mystical world accompanied by a da Vinci-inspired story. The fun continues in the Lilian Baylis Studio as it plays host to a ceilidh with live music from The Ceilidh Liberation Front, a radical ceilidh band that subverts traditions with its own energetic style. Don’t worry if you don’t know the dances before hand, there will be a ‘caller’ who will demonstrate before each one begins. This is a great opportunity for families to have some dance fun together to uplifting music. 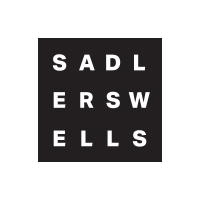 The Sadler’s Wells foyers will be buzzing with activities to entertain before and after the show. Arts and crafts activities include hat making, origami birds, decorating wooden spoons, stained glass and screen printing sessions. 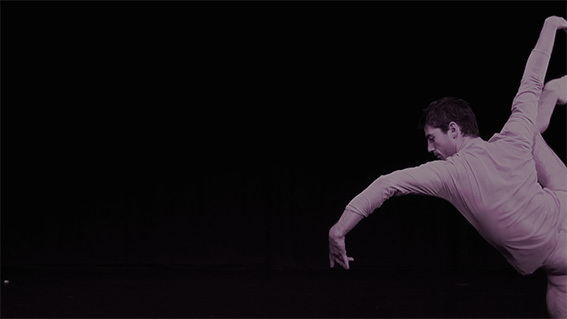 Watch out for the fantastic Casson & Friends with their interactive performance The Dance WE Made – an interactive dance performance which invites everyone, with or without dance experience, to be choreographers. 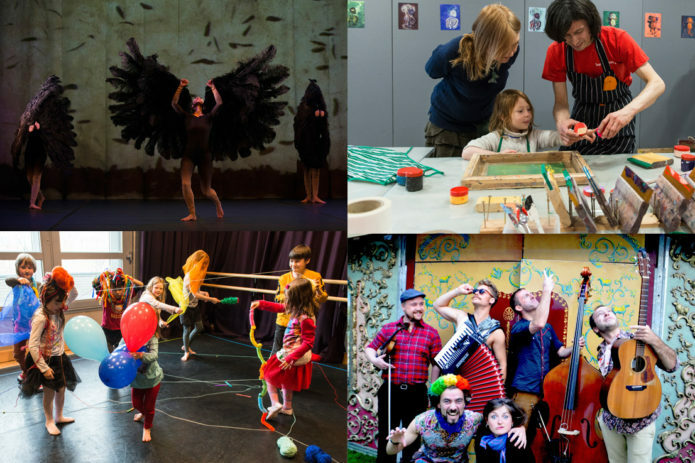 Family Weekend transforms Sadler’s Wells into a magical space for children and their families, it really is an unmissable day out!